The Bronwyn Conroy Beauty School has been at the forefront of Beauty Therapy training in Ireland since 1972 and is renowned for the quality and professionalism of its students. The high esteem in which the Bronwyn Conroy Beauty School is held ensures that our students are much sought after by employers even before graduation and it is no surprise that many of our past pupils have gone on to open highly successful beauty salons and beauty schools not only in Ireland but also across Europe, USA and as far afield as Australia and New Zealand. Our full time Beauty Therapy Course offers qualifications with the worlds major accreditation authorities in Aesthetics and Beauty Therapy including CIDESCO, CIBTAC, ITEC, BABTAC and VTCT. This is a challenging and demanding course. It is for this reason that we insist on meeting with anyone who is interested in enrolling to ensure that this is the right choice for them. Our Tutors have all gained many years of commercial experience and in some cases, are still working in the industry. This ensures that the teaching is up-to-date and fresh. We are delighted to announce a new partnership with Powerscourt Hotel, Enniskerry. The ESPA Spa in Powerscourt Hotel, which is managed by a Bronwyn Conroy Therapist, have offered us a wonderful opportunity for one of our CIDESCO students. Upon completion of the course, Powerscourt will offer a full-time position to one of our students and refund 50% of the Course fees paid! The Criteria for achieving this opportunity will be clearly explained at interview and throughout the course. 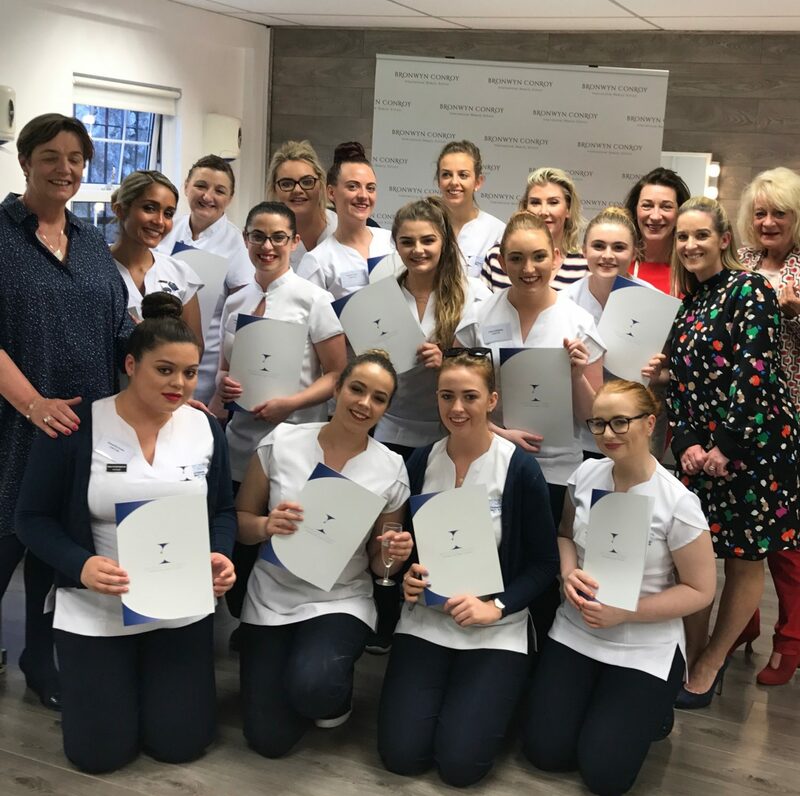 This is a Unique offering from a Private Beauty College in Ireland and demonstrates the recognition that our students receive within the Beauty Industry in Ireland. We are delighted to announce a new partnership with Environ Skin Care Brand. In addition to 2 days training with Environ for all our students, a further 4 days training Advanced Skincare treatments is offered with this amazing brand. Upon completion of their CIDESCO Course students can also participate in a further one-week post grad training programme to move their skills to the next level. Once again this is exclusive to a Private Beauty School in Dublin and ensures that our students leave being qualified in the use of 2 world renowned brands, Dermalogica and Environ. These products are introduced when the students are about to commence their College Salon hours. This offers the students the opportunity to offer “real” salon treatments that can be used to gain confidence but most of all are weeks of real life work-experience whilst still in College! We have now also added the Jane Iredale makeup range to our training. This is another of the IIAA Skincare brands and includes 1 day of makeup training from the IIAA to our Full-Time Beauty Therapy Students. We have this year, added a study mentoring service working with Mr Tony Bellew of One2one mentoring. Tony works with our students to assist them in applying structure to their studies. Tony re-visits during the school term to help the students with any issues they may be having in organising their study routines. He is also available on a one-to-one basis, at a separate fee, should the student require further help and assistance. CIBTAC is an International Examination Board responsible for the education and training of Beauty Therapists worldwide. It has built up its reputation over 25 years and is renowned for its high levels of training and strict quality control. There are now over 150 schools in 18 countries accredited to offer the prestigious CIBTAC Awards. Students sit one theoretical exam and a practical examination to test their knowledge and skills and only those that satisfy the external examiner in every aspect will be awarded the CIBTAC Diploma. The pass rate for CIBTAC is 60%. ITEC International has been awarding high quality and respected industry qualifications since 1947. It is now one of the world’s leading and most successful awarding bodies specialising in Beauty and Complementary Therapy, Sport, Fitness and Hairdressing sectors. In 2011 ITEC awarded over 38,000 Certifications in over 38 countries. ITEC examination process involves 5 Theory papers, one in each of the disciplines, these are multiple choice and have 50 questions per subject. ITEC fosters a close working relationship with our College partners who total over 655 across the world, and has offices in London, South Africa and Asia Pacific and representation in Ireland and the United States of America. ITEC offers Colleges and learners one of the largest Beauty and Hairdressing qualification portfolios including qualifications for employability, specialist subjects and skills enhancement (CPD) The pass rate for ITEC is 60% ITEC has 5 Theory exams of 50 questions for each skill as well as a full practical exam. We’re delighted to welcome Jennifer Rock aka “The Skin Nerd” to the BC team as School Patron. As a Leading Skin Specialist as well as a fully Qualified CIDESCO Therapist and Tutor, who has previously taught CIDESCO in our School, Jennifer is an ideal partner for our School. Jennifer’s role will include visits with our CIDESCO Students throughout their term time with us. She will also be the main contributor to our School Blog and is involved with advanced Skin Course development on an on-going basis. Jennifer’s professional approach to skin and to her role as an Educator within the Beauty Industry was an ideal fit for our collaboration. Jennifer’s passion is education and The Bronwyn Conroy Brand was her first choice for a partnership. The Beauty Industry is a customer focused business so it is critical that you have an interest in maximising your communications skills as well as an ability to sell beauty products, services and your skills. Working in our College Salon each week ensures that you are offered the opportunity to “learn to sell” under the watchful eye of Industry experts who have successfully run their own business’s and are now more than happy to pass on their skills and expertise. The Full Time CIBTAC/ITEC Beauty Therapy Course runs from September to April. Students begin their Beauty Therapy training with the CIBTAC & ITEC Beautician module. The examination for this section of the course will be pre-Christmas, 9 Subejct to confirmation form The examining bodies)The Body Therapy and Electrical Epilation are started in the New Year. These examinations are held in April. All students must participate in College Salon on a Wednesday or Thursday evening 5.30pm – 9pm. The deposit of €2000.00 is non-refundable, this is the minimum required to confirm a place on the course. The school year will finish with a Graduation event, when we hope that friends and family can join our students and the Bronwyn Conroy Team to celebrate the successful completion of their course.